Today, millions of Americans are struggling with alcoholism, but millions are also in long-term recovery. Alcoholics Anonymous and a growing number of recovery organizations are providing support for alcoholics who will face the danger of relapse for the rest of their lives. We have finally come to understand alcoholism as a treatable illness, rather than a moral failure. Today’s advocates can draw inspiration from the victories of sober drunks throughout American history. Finan also tells the dramatic story of Bill Wilson and Dr. Bob Smith, the two drunks who helped each other stay sober and then created AA, which survived its tumultuous early years and has made it possible for millions of men and women to quit drinking. This is narrative history at its best: entertaining and authoritative, an important portrait of one of America’s great liberation movements. — William C. Moyers, Author of Broken: My Story of Addiction and Redemption, Vice President at Hazelden Betty Ford Foundation. 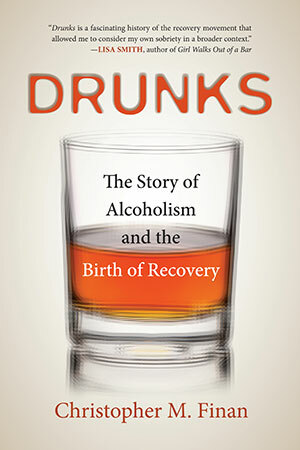 Drunks "is a lively, engaging and enlightening account...Cheers!" – Richard Rhodes, Pulitzer Prize recipient for The Making of the Atomic Bomb. Available in ebook and audio formats.